We take human vision and its capabilities for granted. The amount of information our eyes capture in low light conditions is incredible; although, the amount we don’t capture is equally extraordinary. Throughout the years, and thanks to technology, we have gotten the upper hand when it comes to night time activities like hunting. 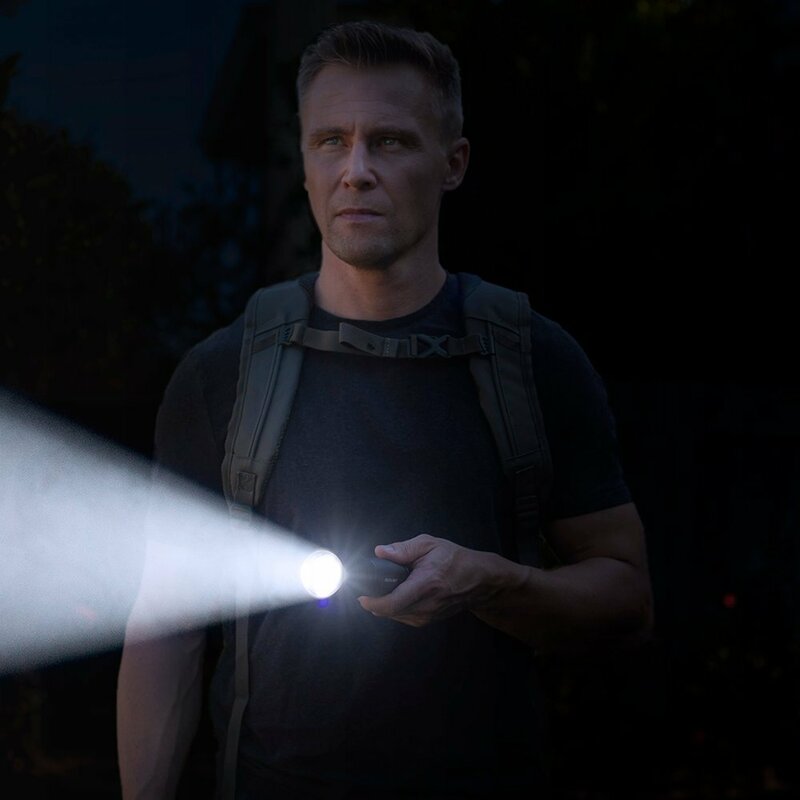 Modern flashlights can emit incredible amounts of light that can not only help you spot game easily but provide you with much-needed utility and in extreme cases, even self-defense. When hunting, having the ability to see game even in low light conditions is vital to your success. In this article, we will give you tips on what to look for in a hunting flashlight and review some of the top products on the market. The right product performance depends on a series of properties that you should pay attention to them. 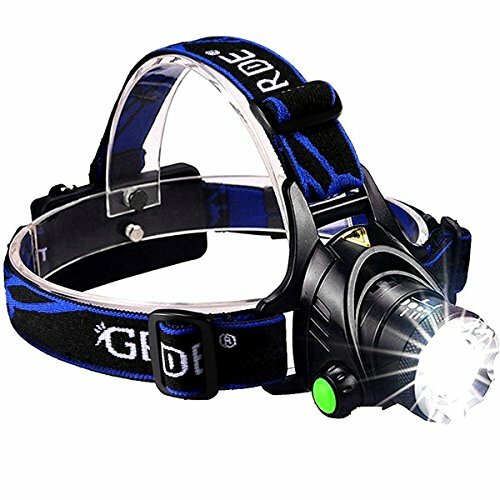 If you use it to traverse the land or following tracks, then you need a product with significant light output to identify the details that you would miss otherwise. On the other hand, if you plan to spot animals, then the range of the model is a priority. Depending on the task, you can prioritize certain aspects to exploit your equipment’s potential. Flashlights are very versatile, so a great product stands out because it isn't too complicated to use. It should simply accommodate your needs. The product’s characteristics can mitigate problems. For example, a noiseless model is useful when you're about to shoot a target. The flashlight should be able to withstand the weather and other elements. Its battery needs to last for a long time even on the highest settings. A good product is sturdy enough to take a couple of hits or even serve an improvised self-defense mechanism. Prices vary a lot between models, but that doesn't mean some are better than others. Sometimes they just fulfill a completely different need. While many lights emit large beams to allow you to traverse the land efficiently, others emit a green or red light that animals find harder to see, which lets you take a better shot without being spotted. Depending on your needs, you can even consider getting a second flashlight without your wallet taking a hit. This is generally referred to as lumens or luminous flux. This attribute measures the brightness of the device, or how much light it emits. However, as necessary as this is, there are other aspects to look for when searching for the right model. Referred to as Candela, this determines how intense the light is around the center of the flashlight’s beam. Sometimes advertisers claim their products travel an incredible amount of distance. Though the intensity varies, without a decent beam intensity, you won't be able to see much of anything. This, as its name states, determines how far the ray of light you’re emitting can go. Depending on the situation, or the kind of weapon you’re are using, you’ll want different distances and colors for your model. Some game animals are colorblind to specific colors and you can use this to your advantage. This refers to the amount of time the product can operate with before it gets to less than 10% of its power. This characteristic is heavily dependent on the type of battery the device uses. Flashlights can fulfill such a large amount of tasks that sometimes they have entirely different features than others, like the color of beam intensity. This list contains the best products for different situations and scenarios so that you can pick a model that fits your requirements. This LED product comes with a light output of 300 lumens, which means it has a decent intensity, even at a distance of 600 feet. That is almost as far a two football fields! It has high, low, and strobe settings so you can adapt to specific situations, and it can last at the highest setting for about an hour of intensive use. When it comes to battery usage, this option uses a single AA option, meaning it is very energy efficient. You could purchase a rechargeable battery to save even more money in the future, and of course prevent a pile of depleted batteries. On intermittent use, one battery can last up to a week. With this light, it’s quite easy to see far away areas as it comes with an adjustable focus and zoom. Both provide an intense beam or just a broader light. This model is compact at only four inches long, and with a weight of only 3.2 ounces, it can be carried anywhere or inside almost any type of pocket. One nice addition is the spiked front which makes it a great last resource defensive tool, should the situation require it. Sadly, this alternative can’t be mounted on a hunting weapon. This device can provide the versatility that other flashlights can’t, as it can be used to either spot objects across a great distance or illuminate the immediate path. Its varied light settings are an excellent complement to an all-around great product. If your demands go more in the way of brightness, then let me introduce to this model. 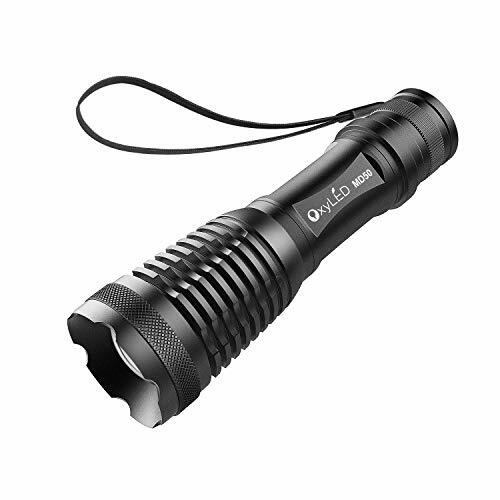 This flashlight features 1200 lumens, which is the brightest on this list. The beam is also ultra wide and can illuminate entire rooms or cover a considerable amount of territory if you’re outdoors. It’s a LED option that has five modes, high, medium, low, strobe, and SOS, which mean it is adaptable to a lot of situations and scenarios. 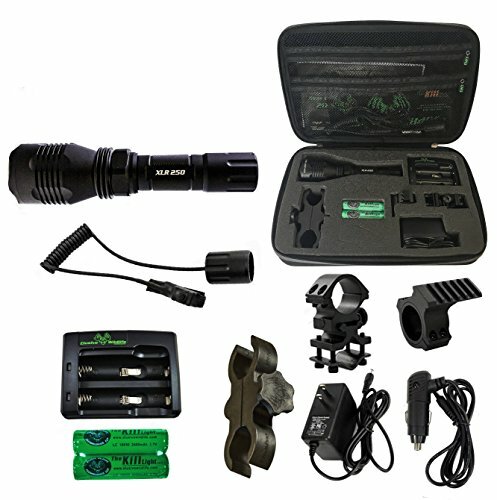 The versatility of this product and its incredible light output make it perfect not only for hunting situations but for any other occasions where lack of light is a concern. It has an aluminum build with anti-slip design for a better grip and can withstand rain, snow, and the manufacturer claims it can survive even ten-foot drops making it a splendid outdoor and survival driven product. Although you can use it in the rain, it is not completely waterproof as it can only be submerged for a short amount of time. In terms of energy demands, it requires four AA batteries which tend to be more cells than other products on the list. It weighs 11.2 ounces which is fairly heavy for a device compared to other products on the market. This model comes with a one-year extended warranty which covers full return should the situation require it. If you need to light up the area around you for maximum brightness, then this is an option for you. The durable material, water, and shock resistance make it a durable model which can be very versatile given its many modes. However, you should get some rechargeable batteries or otherwise you may be looking at a pile of them soon enough. There’s a big difference between white and color devices because the former one is more effective for spotting wildlife without remaining hidden. This option is the most potent green flashlight on the list with 700 lumens, enough to light up a considerable amount of land without being detected. It has a waterproof rating of IPX8 which means this device can be submerged entirely in up to three feet of water and will continue functioning. It can last for 1.8 continuous hours of usage at high mode, and on medium, it can last for about 3.5 hours, which is still more potent than most similar products. Unfortunately, some users have reported that they had problems with the lifetime of the device. If you favor a more long-distance approach to hunting, then this is your product. Spotting game becomes more convenient than in daytime when you can see the reflection of animals so far ahead. This device is a scope-mounted alternative and is the first flashlight that instead of being utility driven is specifically for hunting. 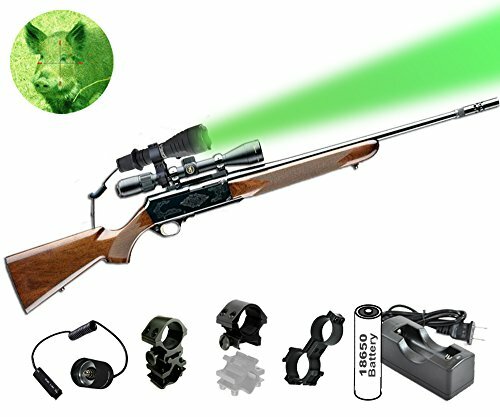 This model comes with four LED modules, green, blue, red, and white to accommodate hunting various game animals that are color blind to certain color schemes like coyotes and hogs. Each color mode on the Odepro KL52Plus has a light output that ranges from 100 lumens to 130, except for the white light. The flashlight comes with an intelligent remote switch that frees your hand to easily carry a gun. Since this is a hunting-designed product, its buttons are entirely noiseless. Its beam can reach a distance as far a 1350 feet. Depending on your weapon, you can choose between two mounts. The first one allows it to be used on shotguns, while the other can fit on multiple scopes with different sizes, no matter how large or small the weapon is. When it comes to durability it’s made out of aluminum, and the design is shock and water-resistant, this also means it is resistant to rough use. It’s not entirely waterproof so it only can stay underwater for a limited time. This model sacrifices the mobility and utility other flashlights have by focusing on doing an excellent job specifically for hunting. Its different light modules offer a great variety of options to stay concealed. If you’re concerned about brightness not reaching a specific place or not illuminating an area, this LED model comes with 1200 lumens. This option is a heavy-duty model and is used by law enforcement, fire departments, and even the FBI so you can guess how reliable it is. It can be ordered with a rechargeable battery kit so that you won’t have to purchase anything else for it to work. It uses either AAA batteries or lithium ones. Utility wise, it’s water-resistant and aluminum made, which means it can sustain some hits and still function. It includes a memory mode so it can remember your desired configuration; this is crucial in moments where you need to stay concealed. The five modes it has are respectively: strobe, SOS, high, medium, and low. 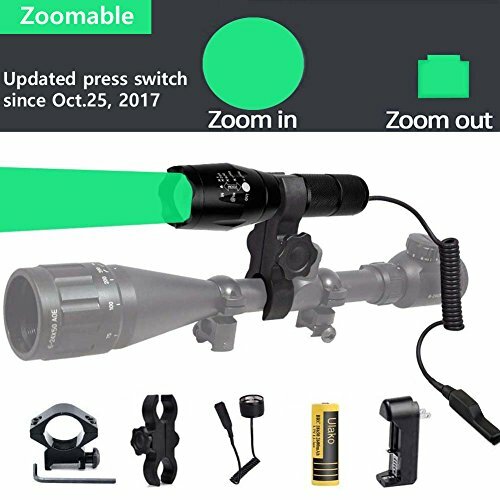 It is built for survival situations and comes with a zoom to spot objects in the distance. In terms of dimensions, it weighs 6.2 ounces and is 5.2 inches long, so it is compact and lightweight. 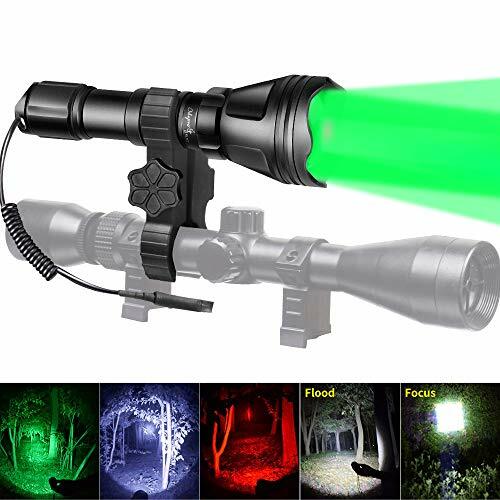 Provided you’re aware that a flashlight this bright can scare off wildlife due to its intensity, then this is a great option. In terms of utility, this product is made to last and has a considerable amount of versatility that makes it an ideal choice. In some cases, the equipment that we use may hinder our mobility or end up being a trade-off between some other trait. This is where a headlamp truly shines. 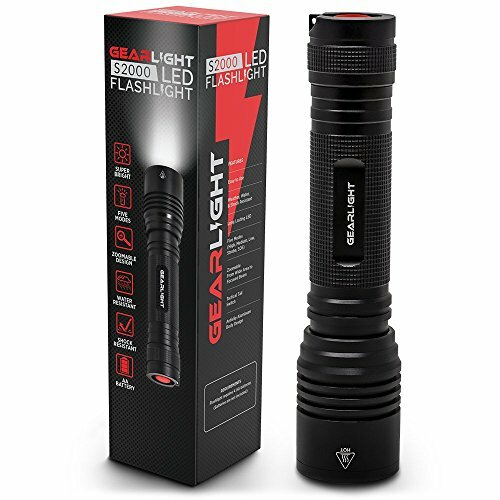 This multi-function flashlight has 1800 lumens and can last up to four hours in "high" mode, which is impressive when it comes to energy consumption. Its strap makes it a versatile option; it can even become a desk lamp if you desire. It has much utility beyond hunting. The product can be turned 90 degrees up and down which allows for better positioning. Since this flashlight has a bright beam, it is best that you dim the beam for spotting game, as it can easily scare animals. The model falls short when it comes to functionality as it only has three modes which are respectively: slow, strobe, and high. It also includes a zoom to expand the light or keep it focused on a single point. It works as an excellent spotting tool as at its widest point at which the beam length is around 200 inches. This light lasts for a long time and can illuminate long distances brightly for while you are out hunting in the dark for long periods. Being able to see your surroundings will keep you safe and allow you to locate that thirty point buck you just took down more easily. The best thing about this product is the fact that you can have a hands-free experience. Although it has a limited amount of modes, its high setting is high enough to spot different objects at a great distance. It can light up an entire area around you or focus on a single point in the distance. Animals like hogs, coyotes, and varmints are colorblind to red and green beams, and for this reason, there are models specifically designed to spot them. What these types of models lack utility wise, they make up for in effectiveness, as game animals won’t even know you’re looking at them. The Orion H30 Predator can be purchased in your desired color and comes with a kit that includes mounts for rail, scope, or barrel. Aside from this, you’ll get rechargeable battery kit. Color modules tend to be just powerful enough to spot animal but not scare them, but this option stands out because its beam distance is enhanced by its 300 lumens reaching a distance of 273 yards. You can pick your preferred color choice, but they do impact your effectiveness. While red is the least visible of the two for most animals, it’s also hard for humans to see. Green is effective against hogs but more visible to coyotes and varmint. This makes the green option perfect for all your hog hunting needs. Needless to say, whichever choice you decide to purchase makes a significant impact on your hunting. The batteries can last up to four hours of continuous use, and the flashlight is waterproof for around an hour which is impressive considering most on the list are only rain-resistant. This product does its job like no other. It could use a little bit more utility, so it is recommended to take another flashlight for activities unrelated to hunting, but nothing spots game with the added benefit of being concealed like this model. This product can cover the longest distance of any green lights on this list with an impressive 300 yards which are more than two football fields. This alternative is a floodlight with means it is used to illuminate large areas, usually fields. Unfortunately, it only has one mode, but it's enough to get a good grasp of your surroundings. Setting it onto a gun is comfortable with its two versatile mounts, and it comes with a remote control so so turning it on/off is easier and more convenient. However, many people say the durability of the switch is not as excellent as the rest of the floodlight. The product comes with a high capacity 2600 mAh battery and a charger. This option is a waterproof and shockproof model made with durable aluminum. The green light is invisible to coyotes, so it is perfect for hunting down these types of animals. It can be mounted so that your hands remain free to handle your weapon optimally. This product's floodlight illuminates fields like no other. Its green color is excellent for staying undetected while providing vision. 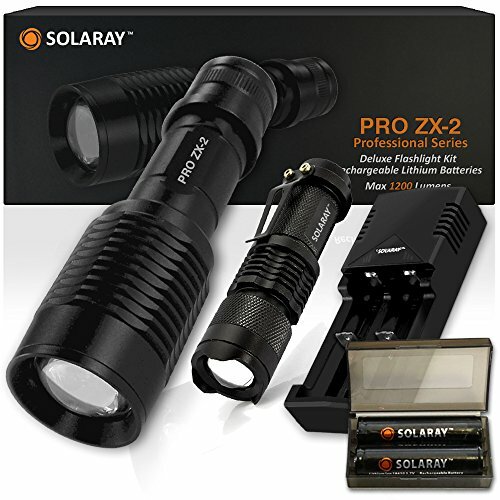 Provided you have a backup utility flashlight, this is a great product. 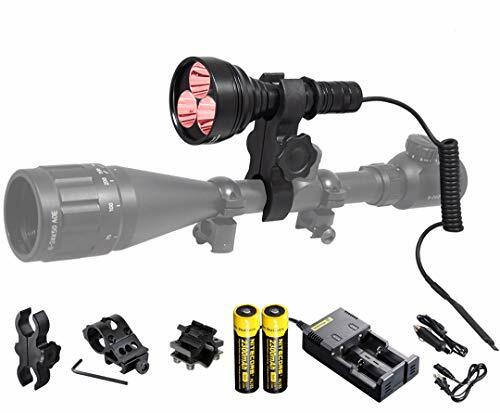 Beyond a mere flashlight, this is a whole setup. This kit includes a floodlight that has four colors options depending on your preference and the type of game you’re trying to find. The includes batteries, charger, hands-free switch, and mounts. When it comes to the product itself, it has an incredible range and can light up an area even at 250 yards, although the most impressive aspect is that eyes are easy to identify even at 500 yards. Although the mount is versatile, it might not completely fit on every product, with some people reporting that they had to buy an additional mount. You can also purchase three options that come with either a triple mode switch or a single one. The third option is a pressure switch that can eliminate sounds. The best thing about this model is how complete it is. It brings a wide array of accessories that can suffice any need that you may have regarding the floodlight. 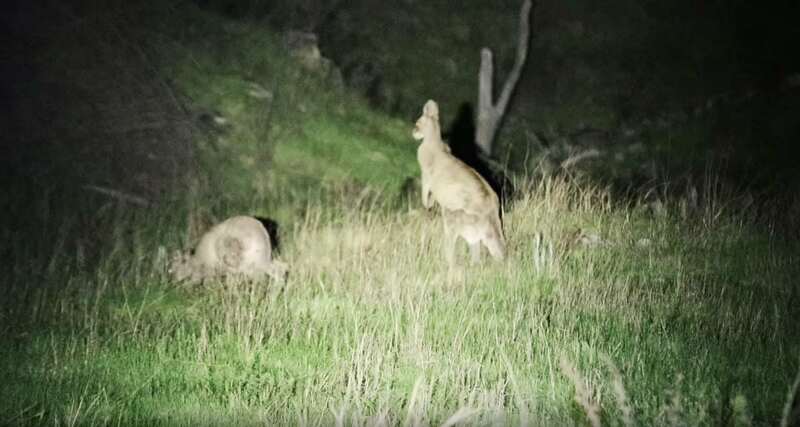 Its long-distance beam can spot animals at incredible distances, making it a practical device. The last model on the list happens to be the most cost-effective one for users on a budget, yet it has an astonishing amount of features, and its capabilities are also excellent. It comes with 900 Lumens. Though it might not be the brightest on the list, it can undoubtedly illuminate a considerable amount of space. The product has five modes, high, medium, low, strobe, and SOS. It is water and shockproof, although it cannot be submerged in water. Its length is 5.3 inches with a total weight of 11.2 ounces including accessories. It takes four hours to charge and the battery lasts over four hours on high mode. The material used is aluminum, meaning it can take a couple of hits and still function correctly. A nice addition is the memory mode function, so you don’t have to go through it in the middle of the action. This alternative is a great option not only for those on a budget but also is perfect for people that want a functional flashlight with great utility and durability. Flashlights do more than illuminate a path. They are essential tools that can not only make you a more effective hunter but offer a large amount of utility that many other products can’t. They come in many sizes and prices which means it wouldn’t hurt to own a couple of different types. Hunting without light is in itself a complicated task, but what makes it more complex is the fact that the eyes of wildlife process information in particular ways and that’s why we are here to clear up a couple of questions about flashlights and hunting. Can Deer See Green Light? There are many myths around about deer vision, and the reality of it is that they can perceive blue and green wavelengths, but they can’t pick up red and orange. That’s why wearing orange gear during rifle season is not a bad idea. What is the Best Color Flashlight For Deer Hunting? Whitetail deer are like some people, colorblind to red, so a dim floodlight of this color is the best piece of equipment to catch them at night. In reality, a deer might not see you, but its sense of smell and keen hearing are way more likely to alert it of your presence.